Arizona Legislative District 23, a district that includes parts or all of Scottsdale, Fountain Hills, Paradise Valley, and Rio Verde, has not seen a local Democratic Representative in recent memory. In fact, Republicans ran unopposed in the recent 2012 and 2014 elections. Democrat Tammy Caputi ran and gained about 26 percent in a three-way race with the two Republicans that did take both State House Seats in 2016. Saying “It is time for a teacher,” Scottsdale Educator Eric Kurland seeks to build on Caputi’s performance and beat either incumbent Jay Lawrence (a reactionary conservative who looks like arch villian Stephano DeMira from Days of Our Lives) or Senator John Kavanagh (another reactionary conservative who is running for the House seat because he is term-limited from running again in the Senate.) Both Republican candidates have been accused by Mr. Kurland of being aloof and inattentive to the needs and concerns of their constituents while catering their votes to the needs of Dark Money (Koch Brother for example, interests). 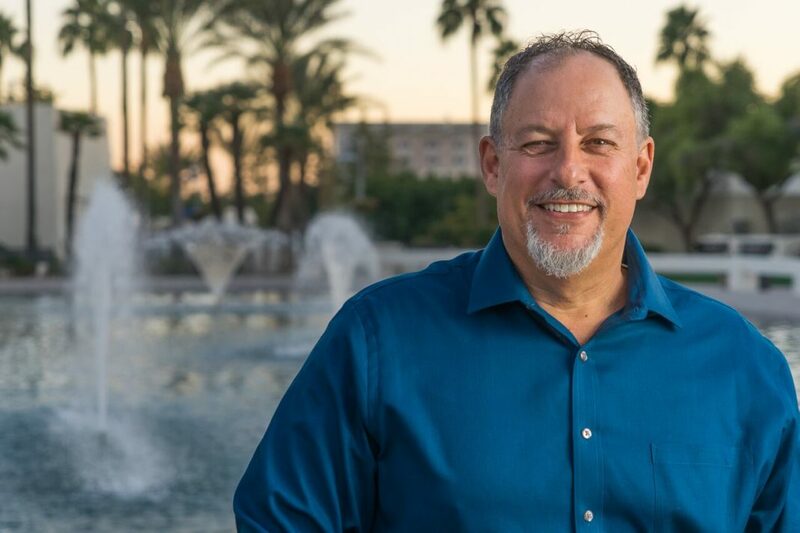 Profiled earlier this summer (please see link below), Mr. Kurland described, at breakfast at the Scottsdale Restaurant “Randy’s” the current state of his campaign and where he sees his path to victory. Have your opponents agreed to debate you? Please advise. Your opponents and their allies will try (or already have) to paint your views and ideas as Socialistic and weak. Please advise how you would counter that. If elected, what would be the first three pieces of legislation you would advance? Please advise what are at least two things you want the voters to know about you that has not been covered in the questions so far? With the increasing prospects for a Blue Wave this November, Democrats are going to need strong personalities in the state legislature who can work in the interests of the people (and not Dark Money special interests), forge legislative alliances and secure progressive legislation that will take care of Arizona’s citizens and move the state forward. Eric Kurland is such a person who can achieve this. Voters in LD 23 should consider what he would bring as a public servant in contrast to the current incumbents. For more information about Mr. Kurland, please click on the links to the below sites. I will be debating Mr. Kurland on Sunday Square Off in two weeks. I did not attend the clean elections debate because my responsibilities as a member of the executive committee of the National Conference of State Legislatures required my attendance at an out-of-state board meeting on that evening.